← BULUT: When Will The West Care About Cyprus And Persecuted Minorities In The Muslim World? Turkey’s projection of its military presence in the Middle East has become a source of worry to the “moderate” Arab states and specifically to Egypt and Saudi Arabia. There are Turkish forces deep inside Syrian and Iraqi territory. Turkey’s military intelligence had been blamed by Egyptian authorities for being involved in the Sinai insurgency, siding with the Islamists, while Lebanese sources have mentioned the activities of Turkish agents in destabilizing Lebanon. In 2014, Turkey deployed a 4,000-strong military contingent in Qatar. In 2018, Turkey completed constructing a $50 million training base in the Somalian capital of Mogadishu to be run by the Turks for 5,000-10,000 recruits from Somalia and other African countries. Moreover, the Sudanese government agreed to lease the port of Suakin, along the Red Sea shore, to Turkey for restoration as a major military and civilian port. Suakin was once the naval headquarters of the Ottoman fleet in the Red Sea. While Iran’s hegemonic ambitions in the Middle East have been under the world’s magnifying glass, Turkey has been silently projecting its military presence in the area to such an extent it has become a source of worry to the “moderate” Arab states and specifically to Egypt and Saudi Arabia. Turkey’s involvement in Syria began with its first military incursion 35 kilometers into Syrian territory in February 2015 to safeguard the tomb of Suleiman Shah, the grandfather of Osman I, the founder of the Ottoman Empire, who died in 1236.1 Turkey claimed that the tomb was endangered by ISIS engaged in fighting the Assad regime. As it transpired, Turkey had kept a military detachment of 40 soldiers to protect the tomb in accordance with the 1923 Treaty of Lausanne with Syria. Under pressure, Turkey moved into Syrian territory and evacuated the tomb and relics in the mausoleum with the declarative intention to return them eventually. During the Syrian civil war years, Turkey aided and promoted “its” rebel factions fighting the Assad regime by supplying weapons, training, safe haven, and passage through its territory. At the same time, Turkey found the way to cooperate with Russia and Iran, the protectors of Bashar Assad’s regime. 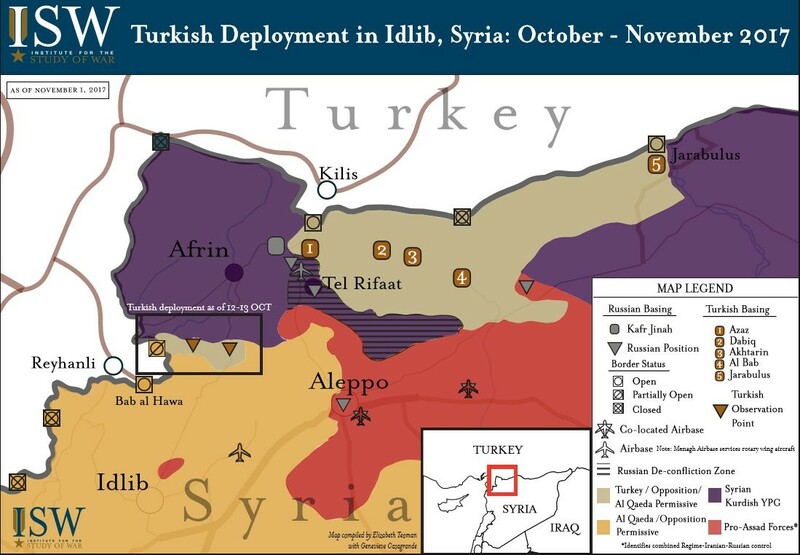 Turkey succeeded in obtaining their acquiescence for its military incursion in the Kurdish area (Idlib region) adjacent to Turkey’s southwest border with Syria. Under the pretext of fighting ISIS, the Turkish forces began in August 2016 what was code-named “Operation Euphrates Shield” which brought the Turkish forces deep inside Syrian sovereign territory, west of the Euphrates river. They only stopped when they saw the American Stars and Stripes flag flying over Kurdish territory east of the Euphrates. Turkey kept up its pressure, and in January 2018, ordered its troops to attack the Kurdish town of Afrin, citing the necessity to fight the Kurdish YPG party considered by Turkey to be another incarnation of the much hated irredentist Kurdish PKK. Ignoring American, French, and NATO warnings, Turkish President Erdogan and his ministers threatened to continue eastwards to eradicate the self-declared autonomous Kurdish areas stretching from Kobani until east of Raqqa. Oddly enough, while Turkey raised the specter of ISIS and the Kurdish PKK, Turkey used the same arguments to extend its military presence deep into Iraqi territory. In the year following the ISIS blitz war and the fall of Mosul, Turkey moved a tank battalion east of Mosul to a small Assyrian town by the name of Baashiqa. The move was presented by the Turks as a gesture meant to train Kurdish Peshmerga recruits for their fight against ISIS. In the course of 2017, in the last days of ISIS presence in Mosul, Iraq asked Turkey to withdraw its forces from Iraqi territory. Turkey answered by saying it would retreat when ISIS is eradicated. With the fall of Mosul and the defeat of ISIS, the issue has not been brought back again by Iraq which suddenly found a helping Turkish hand in isolating the Kurdish enclave as a “punishment” for having dared to conduct an independence referendum. Unlike the Turkish involvement in Syria, Iraq, Lebanon, and Egypt, the Turkish military presence in Qatar has another dimension. Under a defense agreement signed between the two nations in 2014, Turkey deployed a 4,000-strong military contingent in Qatar which in fact is the Kingdom’s other insurance against Saudi Arabia meddling in its politics and certainly a reasonable deterrent against Iranian subversive intentions. No doubt the Turkish presence was seen as an obstacle by the Saudis who seemed to have contemplated a land incursion to Qatar following the siege imposed on it by the other members of the GCC. Finally, following President Erdogan’s visit to Sudan in late December 2017, the Sudanese government agreed to lease the port of Suakin, along the Red Sea shore about 60 kilometers south of Port Sudan. Turkey committed to reconstruct Suakin and restore its golden days as a major naval military and civilian port in the Red Sea. Suakin, protected by a natural bay, was once the naval headquarters of the Ottoman fleet in the Red Sea. The port lost its importance when Lord Cromer, consul-general of Egypt, ordered the construction of Port Sudan to the north, a move that made Suakin fall into disuse and forgotten by the flow of history. This last move was, in fact, the straw that broke the back of the Arab camels. Egypt and Saudi Arabia attacked both Turkey and Sudan. The Sudanese were accused of handing over Arab land to the “new Ottomans,” and they treated Sudan’s president as a traitor to the Arab cause. The issue also impacted on a major water dispute between Egypt and Ethiopia, with Sudan taking Ethiopia’s side. 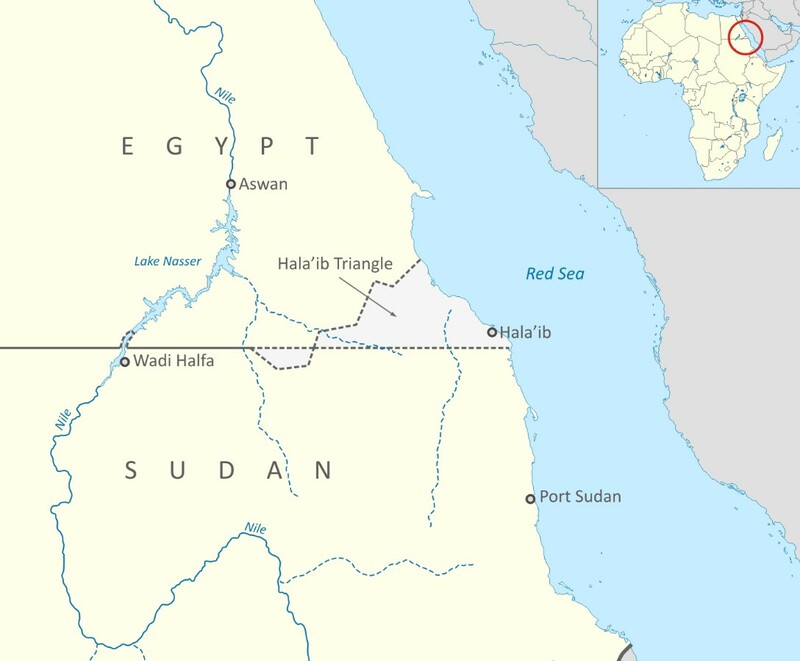 Sudan claimed the disputed area of the Halaib triangle between Sudan and Egypt, a claim ignored by Egypt. Sudan also declared illegal Egypt’s transfer of the two islands of Sanafir and Tiran to Saudi Arabia, claiming they were part of its heritage. On the other hand, the Egyptians argued that Suakin was part and parcel of the Egyptian kingdom and was torn from the mother country by the British. Furthermore, Sudan was accused of siding with Ethiopia on the water dispute rising from the Renaissance Dam in Ethiopia. The recent tri-partite meeting between the Turkish, Qatari, and Sudanese chiefs of staffs only deepened the rift between the countries. Rumors about Egyptian forces preparing to attack Ethiopia’s Renaissance Dam on the Nile were followed by Sudanese troops beefing up the Kassala area bordering Eritrea, Sudan, and Ethiopia. An emergency meeting between the Ethiopian Prime Minister and Egyptian President Al-Sisi seems to have calmed down the parties, all being attentive to the next steps to be taken by Turkey. To sum up, Turkey under Erdogan has projected its military power using the different events in the Middle East as a cover. At this point, it seems that military power is used as another argument in Turkey’s political debate with its rivals and allies. Facing the might of Iran, Russia, the U.S.-led coalition, and Israel, Turkey felt it had no choice but to show its flag if it wants to be heard. This entry was posted in Eastern Mediterranean, Recep Tayyip Erdoğan, Turkish Developments, Turkish Islamism. Bookmark the permalink.